The Dehler 41 CC is a mix of the good and the bad. 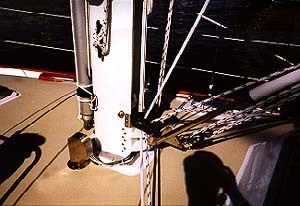 This photo shows the sail controls, that are usually led either side of the companionway, led under the deck, exiting near the helmsman. On one hand, I love the fact that the helmsman can perform all sail trim functions without leaving the wheel. On the other, it is impossible to reach these lines from inside the boat. I hope they are led cleanly and don't chafe because if one breaks, it is not going to be easy to replace. 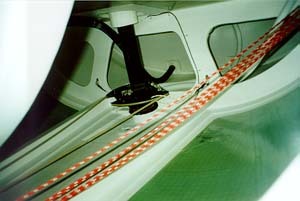 Another shot of the under-deck control lines. 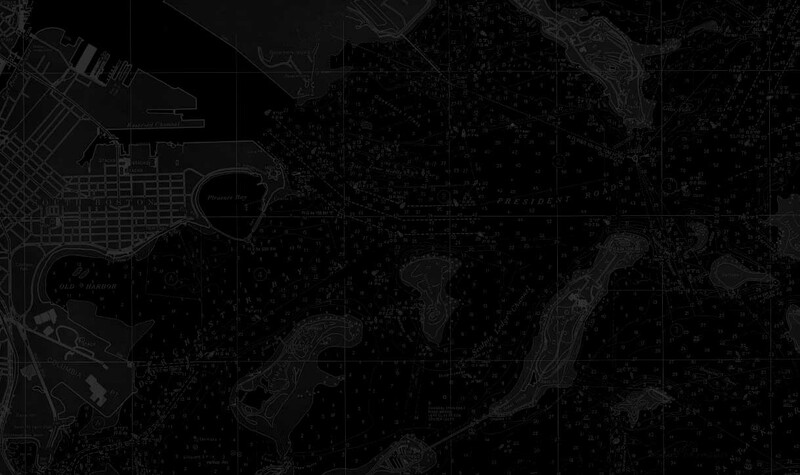 I also have the feeling that concentrating all of the sail control lines like this results in the crew crowding one area of the cockpit when sailing. 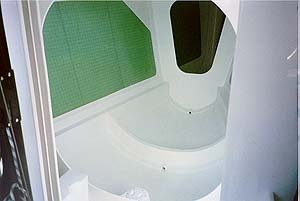 Instead of traditional hatchboard, Dehler uses a captive system where the pieces telescope downward. I wonder if bug screens can be installed on this system. While it isn't clear in this picture, there is NO non-skid on the coach roof. I guess Dehler feels by leading all the lines to the cockpit, nobody will have to go forward. 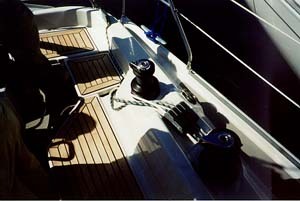 The Beneteau 411 definitely has a cruising cockpit, complete with table and drink holders. However, the cover over the instruments dims their displays. Also, I see people using the table to brace against when heeled, which will mar the wood top. 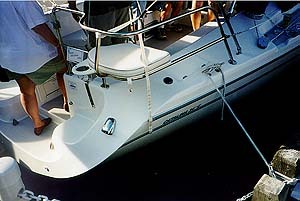 The Beneteau First 40 is a Bruce Farr design that is billed as a fast cruiser racer. 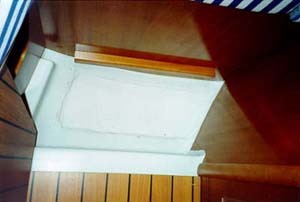 This picture shows the internal pan style construction that seems to be bonded to the hull with adhesives. I would at least like to see some fiberglass tabbing. 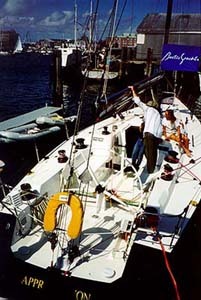 The Antrim 27 has an articulating sprit to allow its asymmetrical spinnaker to be rotated to windward. 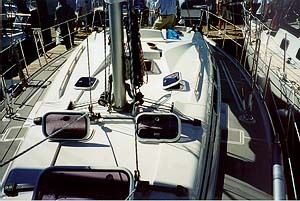 This boat has lots of slick features, including a rig that can induce mast bend despite not having a backstay. 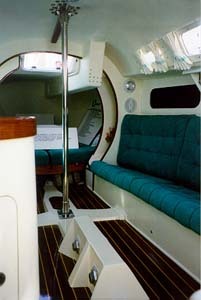 The semi-racy cockpit of the Baltic 50. 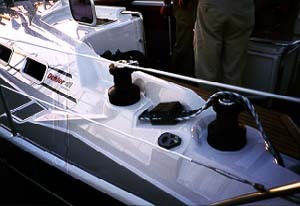 This boat is trying to span the racer-cruiser gap (weighted toward racing) and the cockpit shows some compromises. It seems a little narrow, which will result in crowding, and the coffee grinder is a hazard when negotiating the companionway. I don't remember on which boat I saw this. Notice the mast wiring snakes under a fabricated stainless steel hood. On one hand, it keeps rainwater out of the deck penetration, but it also looks like it would chafe the wires. 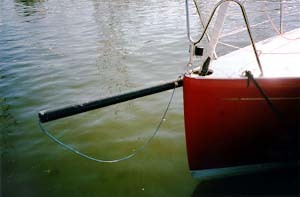 The outboard flanged hull-deck joint covered by an aluminum rub strip. The joint is just screaming, "Mash me against a piling!" 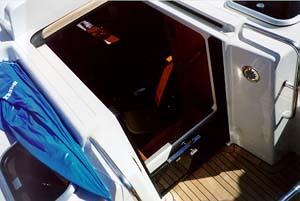 Also, notice the long span between the forward pushpit support and the one on the transom. 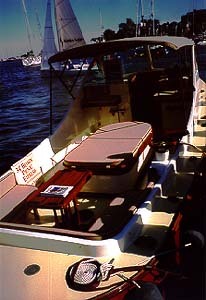 A fiberglass replica of a Chesapeake draketail, gussied up as a picnic boat. It looks inviting, doesn't it? Jeez, race boats don't even have cleats anymore! 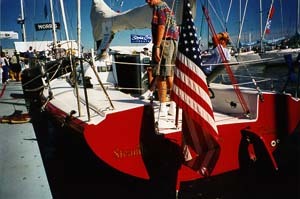 Note the carbon fiber chafe pad to protect the boat from being beaten up by spinnaker sheet blocks. 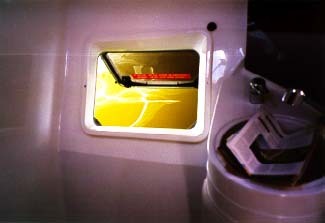 Looking forward inside the Farr 40. 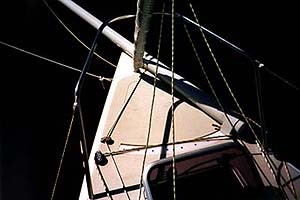 One of the big goals of race boat construction is to minimize weight in the ends. Note the large unsupported area along the topside. I think a longitudinal stiffener spanning the bulkheads would greatly stiffen this area for a minimal weight penalty. 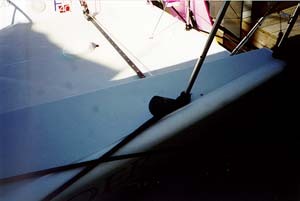 Looking aft under the cockpit of the Farr 40. The Holby (Quest) 30 has since been replaced by the Holby 33. 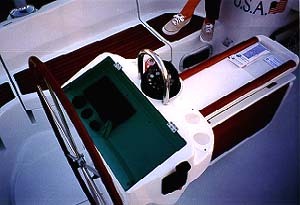 Its lineage to offshore single handing boats is obvious from the wide hull and dual rudders. Marketed as a sport boat this configuration isn't necessarily a liability. It should be noted, however, that the Open 50s and 60s sailed around the world single-handed have well known stability problems. I like the recessed furling drum. It definitely cleans up the stem. Also, note the plumb bow that maximizes waterline length.